Thomas More’s reputation for asceticism is clearly reflected in the BBC’s new adaptation of Hilary Mantel’s Wolf Hall. 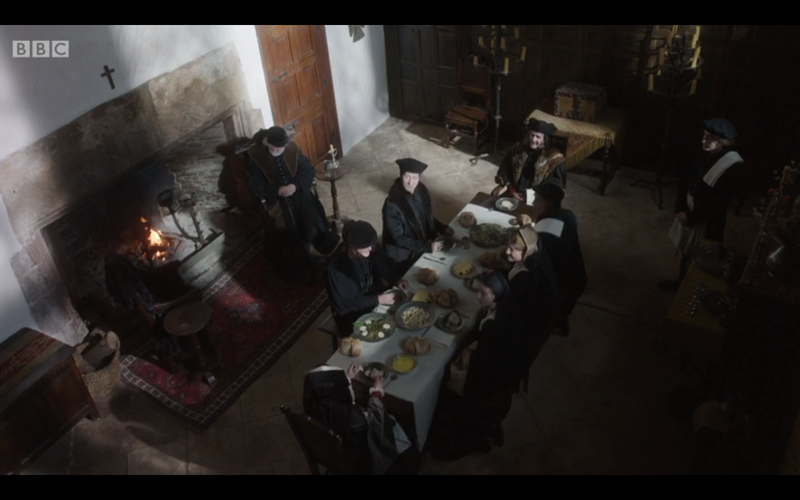 In episode 2 Stephen Gardiner mutters over a dull and sparse-looking dinner at More’s house that there is absolutely no danger of the household Fool’s excitable behaviour resulting from too rich a diet; shortly afterwards, on the boat journey back to Westminster, he complains to Thomas Cromwell how hungry he is. In contrast we hear that Cardinal Wolsey, even as he travels towards his final downfall, asks his loyal servants urgently to send him quails. Food imagery is used to nice effect to tell us most of what we might need to know about the natures of these men—and the nature of their enmity with one another—on multiple levels. Dinner at Thomas More’s house. Likewise, in More’s own island state of Utopia, food-related imagery operates as an effective satirical device and a means of pointing to the everyday realities of life in a better society. Descriptions of communal dining and the collective harvests brought home by city and country dweller alike point the reader to the possibilities of a society in which every citizen contributes to both the production of its sustenance and its enjoyment. Straightforward social and cultural themes such as good husbandry and good eating—including a clear indication of what the right dietary choices are and what they say about people—ground the fiction, underpinning the radical with the commonplace and thus making Utopia a reasonable account of what might be possible. By contrast, the vain and worldly, more impressed with wealth, title and display than simple pleasures and good human fellowship are unable to eat well. Subject to poor taste and bad judgement in their food (as in everything else), they are likely “to accept bitter or sour things for sweet things”. (81) The Utopians’ exploitation of the Zapoletes as mercenary soldiers is partly justified by descriptions of their uncivilised eating habits: “abhorring from all delicate dainties”, they live in ramshackle houses, foraging and hunting rather than cultivating the land. (101) Similarly their bondsmen (or slaves) are said to have an innately corrupt nature, reflected in their willingness to undertake animal slaughter. (64) Though they might enjoy eating meat or fish prepared at a safe distance from the city, no Utopian has blood on his or her hands. Whatever the truth of dinner at Thomas More’s house—and whether he allowed himself or his guests this kind of sensual gratification at dinner time or not—I find it very encouraging to consider that from the moment the term utopia was coined it required full exercise of all of the pleasures of the table.